Many of the early goals of HIT revolved around activities such as sending prescriptions electronically and sharing information with patients. How to accomplish these objectives was a topic for debate. By 2010, a “power team” composed of a small group of the HIT Standards Committee was assigned to look at the former plans for developing the nationwide health information network to determine whether the ONC was on the right path. Fridsma says the team realized the structure of the nationwide health information network “was not going to be adequate or sufficient” to meet its goals. “So we started the Direct Project, with a goal to create a simple way for providers to efficiently exchange information,” he says. But rather than going the usual route and hiring contractors to come up with the final methodology that would be incorporated into regulation, Fridsma says the ONC took a different approach. “We wanted instead to engage the community and have them tell us what works and what doesn’t and what might make sense,” he explains. The structure of Direct is similar to standard e-mail, Fridsma says. “It’s like putting an attachment onto an e-mail and sending it,” he says, adding that Direct has a trust factor in that providers need to be authenticated in the project before they can send or receive messages to ensure all messages are secure. Nine Direct pilots are under way across the country—including Gorge Health Connect in Oregon—and additional HIEs have announced their intention to adopt the system. One of those that recently made the decision to leverage Direct is Michiana Health Information Network (MHIN) in South Bend, Indiana. Tom Liddell, the organization’s executive director, says the first healthcare providers in the MHIN were assigned Direct addresses early this summer. “They use their Direct address and the protocol to send messages to other providers or people at the hospital,” he says. Most early information exchanges were limited to lab results, but Liddell says the physicians are branching out. “They’re starting to understand that the capabilities are much wider than that,” he says. Liddell cautions that because of encryption and other security methodologies, users should know that Direct messages and standard e-mail don’t intermingle. “The key to this is what we call sharing trust certificates,” he explains. “We might have a trust relationship with hospital X or provider network Y, and when information comes over, we’ll gladly accept that.” As part of the trust fabric that underpins the system, Liddell says Direct messages sent to untrusted entities will be rejected and result in an error code. There’s also a tracking functionality built into Direct, which John Blair, III, MD, FACS, CEO of MedAllies, says is key. “Any message going across, from its sending to its receiving endpoints, is tracked,” he says. Senders and receivers are validated in Direct, which not only lays the foundation for the trust fabric within the system but also provides for what Blair believes is a necessary audit trail. “Date tracking, errors, everything that happens … it’s in an audit log,” he says. “Direct is a protocol for how we send information from one place to the other, but it doesn’t define what that information has to be,” Fridsma says. During development, the nature of the content sent via Direct was considered out of scope, so the platform supports both structured and unstructured data. Fridsma says content can be standardized and importable or free-form or contain attachments that aren’t healthcare specific. “You could send laboratory test results, a transition of care document, or a simple message using Direct,” he says. Ahier believes Direct’s content neutrality is crucial to the system’s effectiveness and usability. “If a physician’s office isn’t using EHRs but needs to exchange data, it could use Direct to securely send a PDF or some other type of document,” he says. And because structured content can be exchanged, he says providers are likely to find the system more valuable as time goes on. “If you send me a CCD [continuity of care] document with lab values or a consolidated CDA [clinical document architecture] with all of the important relevant information as an attachment to a Direct message, I can import that into my system,” Ahier explains. Blair says the essence of Direct is its focus on linking together a range of content types across multiple trusted systems. “The Direct Project is really around specifications for interoperability, and it can be used in various forms and fashions for anything from lab results delivery to quality metric measure reporting,” he says. MedAllies is a health information service provider that offers a Direct-compatible solution. 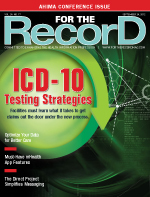 “We have a singular focus for it in our project on allowing connectivity between electronic health records between similar or different vendor systems,” Blair says. An often-used example of a situation where Direct will benefit healthcare providers and patients alike is that of physician-to-physician referrals. Even if both physicians have state-of-the-art EHR systems, records have historically been sent by fax from the referring physician to the receiving provider. The documents must then be scanned as a simple attachment. “Using the Direct Project, we’re going to be able to send structured content,” Ahier says, a change that will allow information to be imported directly into existing health information systems. Patients also are likely to appreciate electronically transmitted records because they’ll no longer beat their documents to the physician’s office. The simplicity of Direct is certainly attractive, but cost is another significant draw. Ahier likens Direct to a freeway ramp where HIEs can get on the health information superhighway without investing a ton of money. “The costs for implementing Direct messaging are much lower than for higher-level exchange services,” he says. That reduced barrier to entry comes at a price in that more robust data-sharing platforms are available. “Direct would actually be a step backward in some cases,” Ahier says. However, he believes there’s a place for Direct among those other systems. “Many of those networks are now also rolling out Direct as well because they can fill gaps in coverage,” Ahier says. Smaller providers may not be connected to an HIE’s feature-heavy exchange system, but through Direct they can still send messages securely. For HIEs that haven’t yet implemented a messaging solution, Direct offers a starting point. “It’s something that can be done reasonably well from a technical standpoint and is something that can be done much less expensively than a lot of what you’ve seen out there up to this point for interoperability,” says Blair, who believes Direct is well positioned to provide much-needed exchange functionality and interoperability, whether it’s as a starting point or as a complement to existing systems. Liddell’s team has had its eyes on the Direct concept for a while. “We were intrigued and said if it got momentum, it would be a game changer,” he says. The MHIN, which supports 12 hospitals along with one large and several smaller laboratories, has launched Direct in one of its smaller hospitals within the network. While the team is still ramping up adoption, Liddell says they’re making quick progress. “We’ve gone from figuring out conceptually how we would make it work in the first quarter of the year to installing tools that would allow us to work through the messaging protocols,” he says. Kuraitis sees Direct as a useful approach in helping less advanced HIEs start to exchange information, describing the platform as an opportunistic tool that may allow providers to increase data sharing among physicians or patients who “aren’t necessarily on the hospital-sponsored EHR.” With Direct’s narrow focus and content-agnostic structure, he says, “It doesn’t solve the problem of communicating everything in healthcare, but it does lay some really useful groundwork for folks who already have a need to communicate and today are doing it by fax or phone.” He also sees it as a way to “build out the edges of the network” into a broader system of exchange. As meaningful use moves forward, Fridsma says his team has proposed that all HIT vendors should have the capability of using Direct to exchange information. “We’re in the process of reviewing comments and things like that, but we put it out there to see if this is something that’s ready to go,” he says, adding that Direct is still a work in progress, with scalability and flexibility being among the main priorities. Liddell says vendors already are preparing their systems, including mobile device platforms, to connect with Direct. “If you have a secure, encrypted mobile device with authentication, you can set up your Direct account right to it,” he says. “It’s incredibly elegant.” Although the MHIN had communication platforms in place and there are several existing clinical messaging products from which to choose, Liddell says Direct still represents a shift in data-sharing practices. “I think we’ll see an integration [with other platforms], and those roads will come together,” he says. Before Direct becomes anywhere near ubiquitous, there are challenges to overcome. “The next hurdle is having it built into the workflow of EHRs so clinicians will use it,” Blair says. Exchanging information is a good first step, but Direct must be leveraged with existing EHR solutions for transitions of care. Additionally, security issues will need to be addressed, including identity assurance and how providers will join in a way that’s secure “without making it so onerous that no one uses it,” Blair says. Nationwide provider usage is another hurdle to clear. If only 10% of the providers connected to an organization work with Direct, Blair is concerned there will be a disinclination to use the technology. “There will be a tipping point on usage of these systems at some point,” he notes, although it will be a few years before Direct usage reaches critical mass.